We have taken what we can from what we observe you doing, but we also take into consideration the vibration that you are holding when you are doing the things you do. Therefore, your actions are not as significant to us as you might think. It is easier for us to see how the action could be taken. The circumstances don’t always dictate what actions you will take. It is usually your vibration that does so, and that vibration is hidden from most of you. So when you see someone doing something, you don’t understand it, especially if it’s something that is hurting another person. It’s difficult for you to wrap your minds around why that person would do that thing, but we see the vibration that is supporting the action, that is fueling it, and that often continues even after the action is taken. So we can see how actions don’t have the effect that you often want them to have. They don’t correct a vibration that is off. And so usually what you have is a mess that has been created from taking the action, and you are still in the vibration that you were trying to avoid in the first place by taking the action. So a good practice is to notice what vibrations you are running as you are deciding what to do, and an even better practice is to notice the vibrations that are supporting the actions as you are taking them, and then you will also want to take the temperature of your vibration so to speak after you have taken the action. You want to notice these things, because eventually you will recognize that you want to act out of joy, love, a sense of peace, a sense of freedom or excitement, and you don’t want to act out of fear, anger, despair, or a feeling of lack. Action often seems like the easiest step to take, but it is also the most futile, unless it is of course supported by a higher frequency vibration. You can always feel for your vibration, but you can’t always take an action. 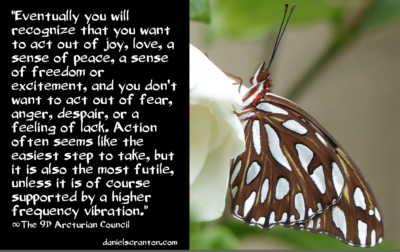 You can always adjust your vibration, but oftentimes there is no action to take. So take that into consideration the next time you are considering taking an action.